Who doesn’t love quick and easy recipes? These little bites are made in less than half an hour, simple ingredients yet they look like you have spent ages making them. It is one of many of my favourite recipes which I have been making for a few years. Whether you gift them, serve them or offer as Prashad, you will get “Wow” and “ooh”, just what you want to hear. So firstly, this post was meant to be up at the beginning of Navratri however, as we all know things don’t always go to plan, however, all is not lost. These can be made for any occasion or personal consumption. I love the vibrant green from pistachios and deep red from jewelled cranberries, the flavours pair well together and a bit of cardamom just adds that dept of flavour. Coconut is my all time favourite since a young age, whether it’s fresh or dessicated I’ll always find a good use for them in a recipe. 1. 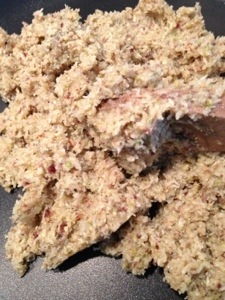 In a grinder grind the cranberry and pistachio to a powdery paste consistency. 2. 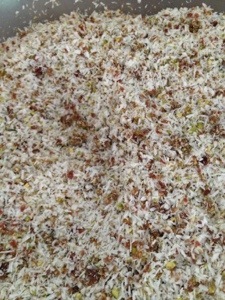 In a bowl mix the ground cranberry, pistachio and dessicated coconut. 3. In a wide non stick kadhai or pan add the dry mixture, cardamom powder and roast for 2-3 minutes on a low-medium flame. Stir continuously to prevent burning. 4. Add the condense milk and continue stirring on low heat for about 6-10 mins, you need to achieve a consistency where you can roll into a ball. 5. 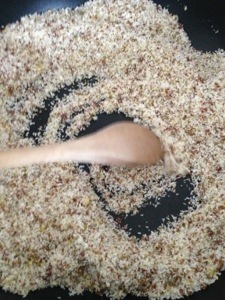 Turn off the heat, transfer into a bowl and let it cool slightly before rolling into balls. 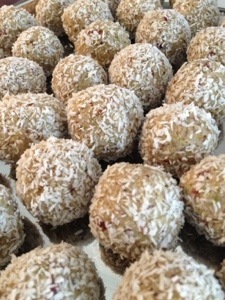 Roll into ball and roll in dessicated coconut. Images copyright of Chinskitchen, please credit Chinskitchen if recipe used for purpose of sale or recreated.